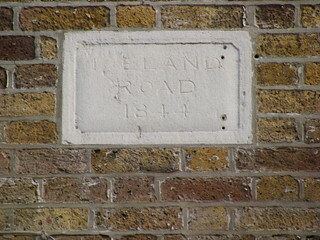 Street sign, E3 Iceland Road, 1844 in Bow. Preserved on the side of The Lighthouse PH, Wick Lane. Iceland Road led to Iceland Wharf, now the site of a large housing project, with the Olympic stadium looming up behind.